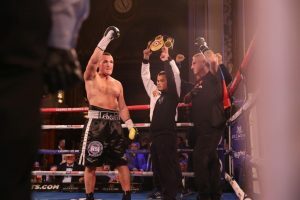 In the slightly surreal surroundings for boxing at Casino de Monte Carlo, former WBA & IBF cruiserweight champion Denis Lebedev scored a unanimous decision victory over the unbeaten Mike Wilson to improve his record to 32-2 (23KOs). 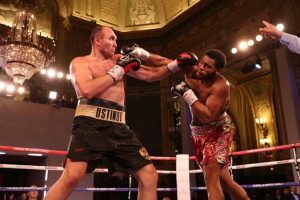 Also on the card, American Michael Hunter scored his second knockout in consecutive months with an impressive stoppage of Alexander Ustinov. WBA super-flyweight champ, Kal Yafai scored a controversial decision over Israel Gonzalez, Fanlong Meng took a stoppage win over Frank Buglioni and Kazakh Thunder, Daniyar Yeleussinov stopped no-hoper, Marcos Mojica inside three rounds. It was Lebedev’s first fight outside of Russia since he lost a split decision to Marco Huck in Germany in 2010, but he started tonight as if he was the home fighter, making the most of the middle ground, punishing Wilson if he dropped his guard even slightly. Wilson was holding his own though, the former US amateur standout might’ve been being beaten to the punch, but it wasn’t stopping him from trying to get on the front foot as it headed into the middle rounds. In the 5th, the Russian landed a huge left hand which the American sucked up but his already bloodied face was getting increasingly redder. 19-0 (8KOs) heading into tonight, Mike was up for the fight and prepared to take some to land one, the problem was in the landing, specifically that he wasn’t. Lebedev stalked around his foe, measured in his approach, constantly chipping away at the taller man from his southpaw stance. In round 7 Wilson tried to switch it up, countering a lot quicker than before but still struggling to significantly dent the iron-chinned, Lebedev. As the fight drew on into the final few rounds of the scheduled twelve, Denis began to tire a little, relying more heavily on single power punches. His movement was however good enough to keep the American from creeping back into contention, until he slipped on the canvas in round 11 and took an unforced tumble. Michael ‘The Bounty’ Hunter yet again fought and won on the road for the second time in just over two months with a 9th round knockout victory over Alexander Ustinov. ‘The Bounty’ Hunter isn’t exactly small, it was obvious which of the two had recently moved up from cruiserweight, but it didn’t stop the American from making the more aggressive start; cleanly landing on multiple occasions with long right crosses. Early on, Ustinov’s only success was coming when he tied Hunter up, despite the Russian’s reach, Michael was countering brilliantly with short left hands. Alexander the great has lost twice as a pro but only stopped once when he was knocked out by an unbeaten Kubrat Pulev back in 2012, and tonight his chin looked as if it was holding up against the power of the smaller man. The prize on offer was the WBA ‘International’ belt, previously held by the Russian and most recently wrapped around the waist of Dereck Chisora after his KO victory over Carlos Takam this year, and in round 8 Michael went all out to grab the title early. He fired and landed two huge right hands dropping Ustinov who rose but only just made it to the end of the round. By the start of the 9th the Russian looked as if he had regained his senses but with just over a minute left of round 9, Hunter once again landed a huge hook, this time with his left hand, and Ustinov slumbered to the ground and his corner threw in the towel. Just two months ago Hunter, as professional, was famous for going the distance with Usyk, two fights later he’s defeated an unbeaten prospect in Martin Bakole, and a respected fringe contender in Ustinov. No doubt big fights await in 2019 for the 30-year-old. Hunter, now 16-1 (11KOs) spoke immediately after the fight, as did his trainer and former heavyweight champion, Hasim Rahman. WBA super-flyweight champion Kal Yafai made the fourth defence of his world title with an underwhelming and controversial 12-round decision over Mexican, Israel Gonzalez. Yafai, now 25-0 (15KOs), came into tonight off the back of an impressive stoppage win over David Carmona in May, and his intentions were clear early on as he concentrated his efforts on landing a stiff single jab to deter the Mexican from marching forward. Gonzalez was relying on quick spurts of hooks and was seriously lacking anything substantial enough to give the champion anything to worry about through to round 4. Into the middle rounds and Gonzalez was doing well to tie Yafai up and limit his outside game, where Kal was having the most success in the early stages of the night. With two minutes left of the fifth the two boxers clashed heads, Israel came off worse, lifting his head to reveal a long cut above his left eye. The ring doctor was called in to take a look but allowed the challenger to continue. Wearing white-gold shorts and gloves, the champion began to pick up his pace as the fight headed into the 8th but his output was lulling. Gonzalez’s energy was good as he bounced in his corner at the end of the round, Israel fought for the IBF strap held by Jerwin Ancajas in February where he was stopped in the 10th round. Tonight, the Mexican made it to round 11 and his punch output increased as Yafai’s hesitancy to land creeped up. Even if it did little to force Kal onto the backfoot, Gonzalez’s accuracy had improved as the fight went on, but he lacked the heavy-handedness needed to overcome a more technical opponent. Southpaw, Fanlong Meng earnt a 5th round TKO over Frank Buglioni, to claim the IBF Inter-continental light-heavyweight belt. Buglioni, though lacking accuracy, made an energetic start which kept the former Olympian at bay through to round three where Frank put his foot down and sensed an opportunity to finish things early. But Meng’s credentials were on display in spots. His counter-left hand catching the Brit on numerous occasions. For the first 90 seconds of the fourth, Buglioni appeared stunned and unable to block the power punches coming his way. However, he regained his composure before the end of the round and fired off his own arsenal to slow down Fanlong’s attack. The two went for it at the beginning of round five of ten, firing 1-2’s then taking 1-2’s and repeat. The former British champion sustained a deep cut above his right eye, seemingly from a punch rather than a clash of heads, and on two occasions in the fifth the referee called a timeout for the ring doctor to inspect, unfortunately for Frank on the second timeout the doctor called an end to the bout meaning Meng picked up a technical stoppage victory improving his record to 15-0 (9KOs). 2016 Olympic welterweight gold medallist, Daniyar Yeleussinov moved to 5-0 (3KOs) with a third-round stoppage victory over Marcos Mojica. It was evident from the first bell that there were quite a few levels between the two boxers. Mojica, 16-2-2 (12KOs) who’s fought almost the entirety of his pro career as a lightweight, did his best to evade attack and did reasonably well in the 1st round to avoid the ‘Kazakh Thunder’s’ heavy left hook. However, in the second, Daniyar dropped his Nicaraguan foe with a fast-left hand that partially landed on the back of Mojica’s head, knocking his balance. Mojica rose and began to open up his own attack, but it was sloppy at best and on more than one occasion he lost his balance trying to get out of the way of the Kazakh’s quick handed combinations. Marcos was dropped for a second time just before the bell for the end of round 2, rising to make it to round three. Just 30 seconds into the third, Yeleussinov dropped Mojica for a third time and it set up the finale as he unleashed a volley of punches as soon as Marcos rose, forcing the referee to step in and call an end to the fight. Daniyar now moves to 5-0 (3KOs).